Germany is no place where you can find funk 45s. Even more unlikely it is to find a funk 45 which has been produced, recorded and released in Germany in the 1970s. And we talk about proper funk, not the cheesy-catchy euro funk stuff which most people have in mind when thinking of european funk records. There are a few exceptions though, and this one is certainly one of them. 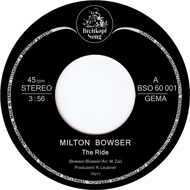 Still under the radar and not being played on neither the current soul nor funk scene,Milton Bowser'sThe Ridecould be a future hit within both scenes. No matter how other people rate it, we like it quite much and are just proud to present this historical peace of german funk.